^ Several primary sources suggest his birth name was Hugh Ernest Leo Williams. ^ "New York, New York Passenger and Crew Lists, 1909, 1925–1957". FamilySearch. Retrieved 2 July 2016. ^ "John Williams Is Dead at 80; Stage, Screen and TV Actor". The New York Times. 8 May 1983. Retrieved 2 July 2016. ^ a b c "John Williams Is Dead at 80; Stage, Screen and TV Actor", New York Times, 8 May 1983. Retrieved 3 August 2017. 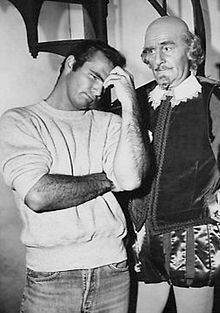 ^ Episode "Bub's Butler", My Three Sons, originally broadcast 4 April 1963. TV Guide, a subsidiary of CBS Interactive, Inc., New York, New York. Retrieved 4 August 2017.